In the locker room after the Bucks' game in Phoenix, guard Gary Neal (right) was heard yelling at center Larry Sanders, "I earned my money. Why don't you try it?" ST. FRANCIS, Wis. — The Milwaukee Bucks went back to work Monday after returning from a disappointing road trip that ended with two players getting into a heated verbal spat in the locker room following Saturday’s loss in Phoenix. Larry Sanders and Gary Neal got into a dispute in front of reporters in the locker room at US Airways Center, as Sanders was heard questioning Neal’s attitude. Neal left the locker room shouting at Sanders, "I earned my money. Why don’t you try it?" Bucks coach Larry Drew met individually with every player on the roster Monday morning before practice, trying to prevent the situation from getting out of hand. "You don’t allow the snowball effect to take place," Drew said after practice at the Cousins Center. "That certainly can happen. It was an isolated incident that happened after the game when emotions are extremely high. We’ve talked about it individually and I talked to them about it as a team. We’ll move on." Neal had no comment about anything related to the incident when asked about it Monday, but Sanders said he was trying to keep things positive. "It is just something to get past," Sanders said. "Guys are going to get into it. It’s a part of it. It’s a passionate game and everybody wants to win. It was an emotional day, I think an emotional day for everybody. "You want positive comments. You want healthy, positive things coming from the team. I’ve been around teams and sometimes when negative things linger, it can hold a team back and have us going in the wrong direction. My message was we need to speak encouraging things and stay on the positive side of things despite what is happening. We’re all in this together." It’s no secret last year’s Bucks team had chemistry issues that may have hampered the team’s play, something Sanders saw firsthand. "And that plagues," Sanders said. "That plagues the team. I’ve been around teams guys have had things to say and it lasts all year, breaking the team down. I’m just trying to nip things in the bud." Sanders said he hasn’t spoken to Neal since the incident and doesn’t feel there’s any need to have further discussion. "I think everything was said then," Sanders said. "I think a message was kind of sent across. Hopefully we’ll be able to keep things on a positive note both individually and team wise." While Neal didn’t speak directly to what happened Saturday, he did address the current situation of the team. Milwaukee fell to 7-26 with the loss to the Suns, 2 1/2 games worse than anyone else in the NBA. "We just have to find a rhythm and get to playing good basketball," Neal said. "It’s tough because every team is good and right now we kind of have that mark on our back that nobody wants to lose to us. It’s tough though, but we have to figure out a way and keep grinding. "Some teams have that mark on their back because everybody wants to play against them and everybody is motivated to play against them. I think we have the other mark. Everybody is motivated to play against us for the wrong reasons. We have to try to correct that. The only way to do that is if you come out and grind and put your best foot forward night in and night out. I think we’re talented enough to do it. We just have to string some good basketball together." This is certainly a different situation than what Neal has been accustomed to in his career. He’s gone from playing on one of the best teams in the league to a franchise in transition. The worst record Neal has had in the NBA is 58-24 last year with San Antonio, while the Bucks have already lost 26 games. "It comes from chemistry," Neal said. "Everybody knows what’s expected of them, everybody knows what to do on the offensive and defensive end. (The Spurs) system has been in place for almost 15 years. They worked to get to that. I’m sure when they started out they were just like us. "It’s a building process. Everybody just has to stay committed and focused on the process. You have a new system and new guys. It’s going to take some time. That’s just the truth of the matter. "At the end of the day you are still a professional whether you are winning 60 games or you are not winning 60 games. You get paid to do your job, you get paid to compete. At the end of the day, if you are on a struggling team or a team that’s on a 30-game winning streak, you still are expected to do the same thing night in and night out in practice and in games." Both Sanders and Neal called Drew’s individual meetings positive. The Bucks coach also addressed the team as a whole and all parties seemed ready to move on and put this behind them. "I think it was very healthy for the team," Sanders said. "I think he spoke some positive words to everybody, some encouraging words reassuring guys what he needs them to do and what their roles are and what the team needs from them." "Coach Drew is amazing," Neal added. "Throughout the whole process of me coming here through free agency and going through training camp and to this point where I’m at now, coach Drew has remained positive. Firm, but positive. That’s always a plus especially when you are the leader of the group when things aren’t going well. "Especially to have some of the younger guys that we have that are playing, it’s good to see how positive coach Drew is. That’s huge." Henson still out: Bucks forward John Henson has shed the walking boot on his injured left ankle, but he won’t play Tuesday against Golden State. Henson was limited at practice Monday, but was able to get up and down the floor to the surprise of Drew. A high left-ankle sprain suffered against Cleveland on Dec. 20 has kept Henson out the last four games and five of Milwaukee’s last seven contest. 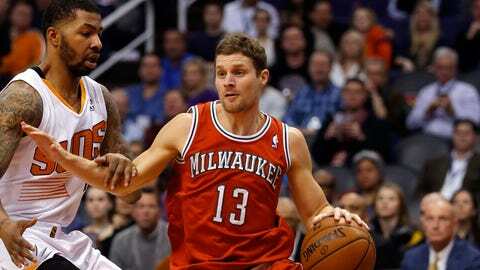 He’s hoping to be able to return to the Bucks lineup Friday against Chicago or for Saturday’s game in Oklahoma City. 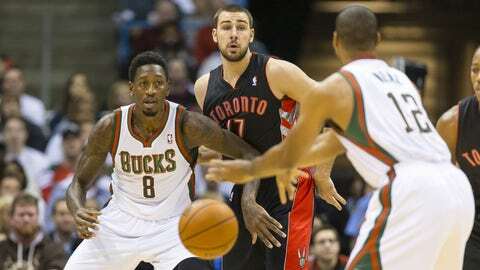 "That’s kind of what we’re shooting for," Henson said. "Hopefully it comes to fruition." Henson spent over an hour per day getting treatment on his ankle while the Bucks were out west. It wasn’t fun for him to sit back and watch the team continue to struggle. "Oh, man. I was bored," Henson said. "It was cold, it was snowing and they were in LA. It was tough, but I did get better."